Hi everyone! I am excited to share more of the STELLA CHROMA holiday releases with you today! 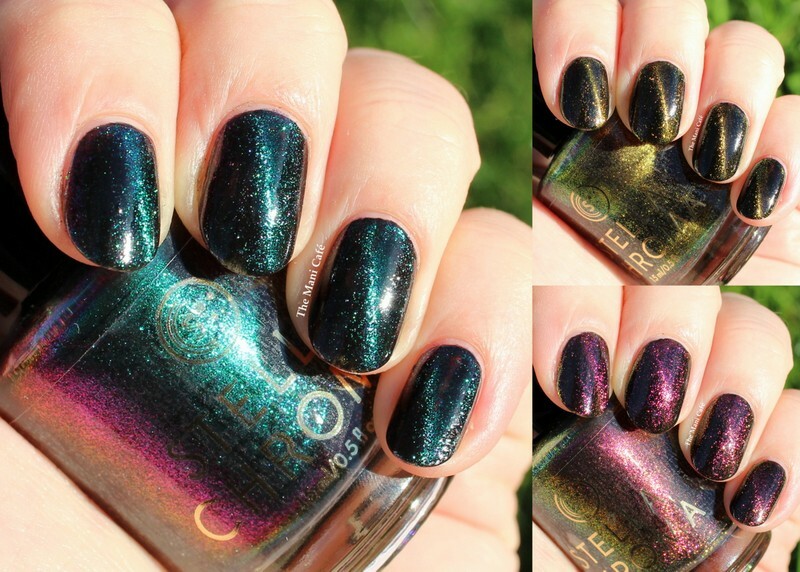 This is the Constellations Trio consisting of 3 beautiful multichrome magnetic flakie polishes! I was so excited when I heard that Pam was making some magnetics as I have really been enjoying them lately and I just knew she would do them well, and with a twist! Each polish in this collection has a black jelly base but then the colour is different with the shimmer and flakes! These polishes can be worn alone in 2-3 coats or as a topper with 1-2 coats. I decided to swatch them over a black base and I'm glad I did! They really pop like this! Each swatch shows 2 thin coats over a black creme, no topcoat! I used a simple bar magnet for the magnetic effect. Orion is a 'black jelly polish with violet-blue-green shifting magnetic flakies'. This is like the best colours of multichrome polishes in my opinion but with the added twist of being magnetic. The effect works really well and is very striking (the same is true for each one of the trio). Gemini is a 'black jelly polish with green-gold-red shifting magnetic flakies'. I didn't think I would love this one as much as green and gold don't tend to be my favourites but I actually wore this as a full mani as soon as I'd finished swatching. The colour combined with the magnetic effect really reminds me of cat's eyes! Perseus is a 'black jelly polish with gold-red-violet shifting magnetic flakies'. I knew I'd love this one from when I saw the first swatch Pam sent out and I wasn't disappointed. The shimmer is so strong and it just glows! Each of the polishes will retail for $13 and they will be available together as a set for $36 until December 7th. Pam will also have a variety of magnets available to purchase as well. I tried out an arc magnet on my full mani of Gemini. It also worked perfectly and looked beautiful. I'll try to post pictures of that soon!